Lufenuron is used as an anthelmintic (anti-parasitic against intestinal worms), antifungal and flea remedy for pets. Read the Exova labs (US) test report (EU-compliant veterinary purity): Link to PDF. Although the EU purity requirements for veterinary medicines are identical to EU purity requirements for human medicines, this product is sold for animal use only, specifically for dogs and cats. 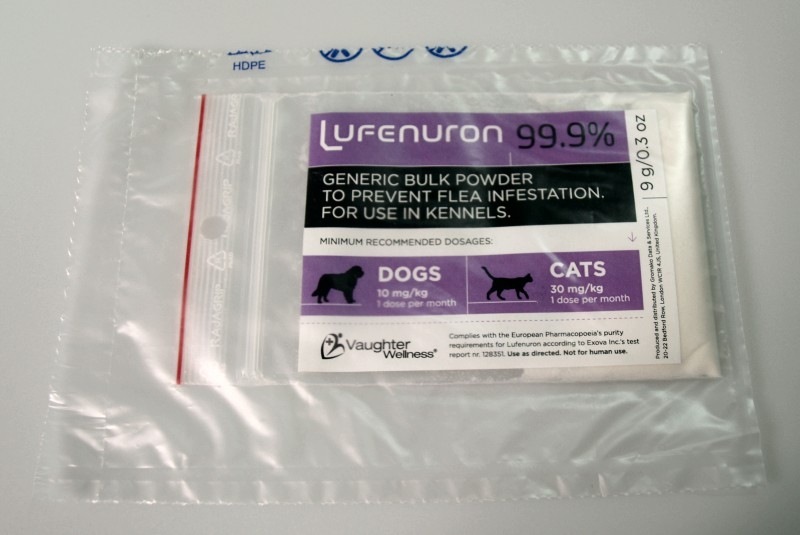 Our Lufenuron comes uncapsulated because Lufenuron is not water soluble and can only be absorbed when thoroughly mixed into food that contains fat. Capsulated Lufenuron is very poorly absorbed because it forms a powdery lump in the GI tract that can't dissolve properly. In order to dissolve into the fat in the food and be absorbed during the digestive process, it needs to be finely dispersed into the entire meal. Measuring off a single dose for a pet for flea-prevention purposes requires an expensive milligram scale (expect to pay at least 200 dollars). We do not assist in calculating dosages.